Hoarding is a serious psychological disorder that affects not only the hoarder but their loved ones. 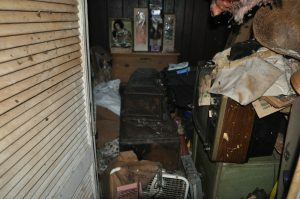 It can lead to danger in the hoarder’s home, with severe cases blocking entryways to homes with teetering piles of boxes, papers and broken appliances, pest infestations and limited accessibility to different rooms in the home. While the extent of the problem may be hidden for months, there are a few signs your loved one may exhibit if they have begun hoarding. Most people are chronically disorganized, often misplacing keys, their phone, the remote control. Hoarding highlights and increases this, making the individual constantly late for appointments because something is always missing. Instead of being able to find smaller items, it gets in the way of everyday life and the ability to function normally. As hoarding gets worse, the individual may become withdrawn due to the embarrassment about the amount of clutter in their home. In addition to not wanting to host guests, your loved one may be reluctant to leave their home. Collecting things is a common hobby, but when a collection becomes overbearing and your loved one has run out of room to display items, what was once a fun activity can become a distressing inconvenience. Rather than enjoying the activity, the collection can become a cause of adverse emotions and stress. When the feelings begin to turn negative, the hobby has likely developed into a hoarding problem. If your loved one is constantly bringing more things than they need into the home, whether shopping in a store, online or through finding free things, it could be a sign of a developing hoarding issue. If multiples of the same item keep appearing, particularly furniture and appliances and remain unused, it may be time to discuss the problem with your loved one and a professional. If your loved one is suffering from hoarding, it is important to treat the matter delicately. After contacting professionals to help your loved one receive the help they need, contact Flannery’s Handymen for a hoarding cleanout. Our team is trained to handle each situation with the highest sensitivity, working discreetly in order to maintain your loved one’s privacy. To schedule a cleanout, contact Flannery’s Handymen by calling 781-775-9943 or by filling out our online contact form.